Situated in the Turkish province of Mugla, Marmaris is a lovely coastal city in the country and has become a favorite for many tourists from many parts of the world. The number of travelers on a trip to this part of Turkey has increased to more than 400,000. Located along the Turkish Riviera coast, it is a decent place for those who wish to enjoy sailing and diving. Most of the visitors have been attracted by the wonderful features of this city, including the old sites and the long coastline. Among the great attractions to visit during cheap holidays to Marmaris are its charming beaches, which have just the kind of favorable environment for relaxation after some hectic sightseeing schedules. Long Beach is one of these places to explore as it positioned close to the urban beach of Marmaris, it offers opportunities to relax in the warm sunshine and you can enjoy swimming in the waters that touch its soft sand. Here we will convey you best Marmaris activities. Marmaris Boat Trip is definitely one of the most popular daily excursions in Marmaris. Explore the closely located islands, caves and coves! Enjoy the grasp of nature with the touch of the sun on your skin and the sea breeze on your face! Take a swim, sunbathe and ultimately relax! All dive centres have well organized Marmaris excursions and underwater tours in addition to lessons for beginners. In this city, you can enjoy water skiing and many other water sports in Marmaris during your holiday. This special area of the city has some wonderful beaches with excellent facilities provided by local water sports tour operators. You can go on fishing tours with a small boat rented from them. A daily trip to Cleopatra Island will be another great activity to enjoy while on holiday in this part of the world. It will allow you to see the stunning natural beauty of the countryside. You can also discover some beautiful villages during your trip to this region. 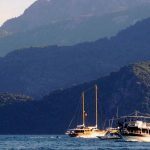 Full day Marmaris Dalyan boat trip to a coastal village called Dalyan will allow you to enjoy swimming in the clear waters of the Adak peninsula. You can also stop at the world famous Iztuzu Beach and relax under the warm sun on its powdered sand. While enjoying your holiday in this Turkish city, you will also be given a chance of enjoying horseback riding. These Marmaris daily tours will take you through the pine forests and the mountain river, enabling you to taste some charming views along the way. You can get an adventure trip through the rugged trails of the mountain with the aid of an off-road jeep tour. The cotton Castle in Pamukkale is a wonderful and unique site for visitors on a trip. Its natural spring water rich in calcium cascade down the hill and react with atmospheric carbon dioxide turning into chalk. This water is very good for many skin diseases, allergies, blood pressure, etc. Also you will have the opportunity to see Hierapolis Ancient City in Pamukkale. Cappadocia is one of the best places in Turkey and even in the world. To be honest it is a place where everyone should visit. You will have a chance to see beautiful caves and cultural richness. If you come to Marmaris for a long period, you definetely should visit Cappadocia. Marmaris Cappadocia tour is organized one day a week and takes 2 days and 1 nights. Actually Fethiye is not in Marmaris but it is really close to Marmaris. People who come to Marmaris, might go to Fethiye and can visit both Fethiye and nearby points. Also they might have chance to do paragliding in Fethiye Babadag. Fethiye is the most suitable place to do paragliding in Turkey. In fact, there are many international certificates on this issue. Just consider this option. You can also see the attractive dolphins at work by paying a visit to Marmaris Dolphin Park. The times spent in Dolphin Park can give you an opportunity to swim freely with these wonderful aquatic creatures. Marmaris has many well-known resorts, bars and hotels. It is prominent for its pleasant nightlife in bars and many clubs along the coast. For evenings, comfortable bars and restaurants which have several delicious dishes from all over the world are available. There are plenty of night beach parties to join and enjoy. As you see there are many Marmaris activities. Come and enjoy.